Leadership of Cheyenne Mountain Entertainment is now in dispute, with the ousted CEO contesting his dismissal. Stargate fans continue to await news on Stargate Worlds, the long-expected MMORPG set in the Stargate universe. Development on the game reportedly continues despite funding problems, layoffs (story), and most recently a bankruptcy filing (story). But just who is in charge at Cheyenne Mountain Entertainment, the studio developing the games? Leadership of the company and its subsidiaries is now in dispute, with ousted CEO Gary Whiting contesting his dismissal, according to court documents. In a new interview with Examiner.com, CME and Firesky President and CEO (or is he?) Tim Jenson discusses the situation candidly. According to Mariscopa County Court documents, a receiver was appointed by the court on March 1. This appointee is intended to smooth out the operations at the company while the leadership dispute is settled. Cheyenne Mountain shareholders filed suit against Whiting in February for mishandling the company, prompting the company’s board of directors to fire the CEO (press release). Among the list of charges filed by the plaintiffs is fraud, breach of fiduciary duty, and unjust enrichment. The original filing also reveals the details of the company’s financial woes — long the subject of speculation among fans — including difficulties meeting payroll in late 2008 and early 2009 and mounting tax and vendor debts. But Whiting is contesting his dismissal from the company in court and (according to Jenson) continuing to represent himself as the head of CME — including filing bankruptcy last month on behalf of the company. Fan site SG Gaming Info previously reported, with a statement from Jenson, that the court had rejected Whiting’s bankruptcy filing on behalf of CME. Based on court documents and Jenson’s statements to Examiner.com, however, that decision has not yet been reached. When reached for comment, a representative of CME declined to comment to GateWorld on the status of the bankruptcy filing, as it involves ongoing litigation. But the bankruptcy filing has already had a negative impact on the company and the willingness of its investors, according to Jenson. 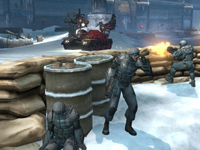 Meanwhile, the company continues to support the newly released game Stargate: Resistance, an online, third-person shooter that debuted in mid-February. As that title is strictly online, it requires a solvent company to continue to provide the necessary servers. Keeping the company’s one revenue stream (outside of investor support) going is, of course, a priority. Jenson revealed that the company is currently looking for outside help in keeping the game up and running, as well as continuing to develop new content for players. “CME is currently seeking ways to keep the Stargate: Resistance game operating and growing including partnering with other companies in a joint venture or outsourcing type arrangement,” he said. As for Stargate Worlds and Cheyenne Mountain’s long-term viability? Its continued reliance on investor dollars to pay the game’s developers and other support personnel means that the bankruptcy filing is standing in the way. That, and the company’s leadership, is now in the hands of the court. 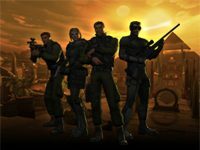 They need to cancel Stargate Worlds and develop a SINGLE-PLAYER FPS/TPS for all consoles (including Wii). An MMO is WAY too ambitious for a small company like CME, or Firesky for that matter. Thanks for mentioning SGGamingInfo Darren. Something along the lines of Star Trek Elite Force, but Stargate obviously. Um, Stargate Alliance never came out for Xbox, it was canned before it was finished due to it’s low quality. Stargate The Alliance was cancelled even though it was practically finished. SGR is okay but badly lacks content. Lost interest in SGW as soon as it was mentioned it was going to be a point+click combat system which is doubtful to see the light of day. Stargate really hasn’t had much luck with games. More and more SGU reminds me of The Matrix Online (MXO). Based on a franchise, poor concepts and a shakey (at best) circumstances surrounding its developer. I can only imagine what the actual designers must be thinking each day they go into work and hear about this crap.